Dreamscience have now successfully added the 2015/16 Mustang to the newly released iMAP mapping handset. The handset will come with Two tune files for the V8 which will offer Two different power outputs from the Engine. Given the small window of time we had for the initial tune file development, we managed to write Some very good tunes and they have now been finished and lots of progress made. 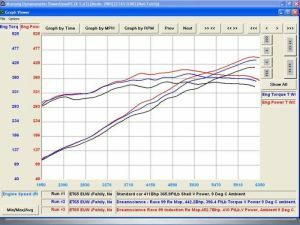 Not only have the guys at Dreamscience managed to increase the power output from the 5.0 V8 they have managed to smooth out the power and torque curve making the driving experience much more enjoyable. Torque delivery is quick and controlable. The main aim of the Dreamscience Remap was to try and retain the OEM feel, fuctionality and reliability. Upon testing the car in its standard Format on our Mustang MD1100 Gladiator chassis Dynometer, the car porduced and accurate 411BHP and 365.9Ftlb, the torque a little lower than the specified factory figures but this is expected from such a new engine. 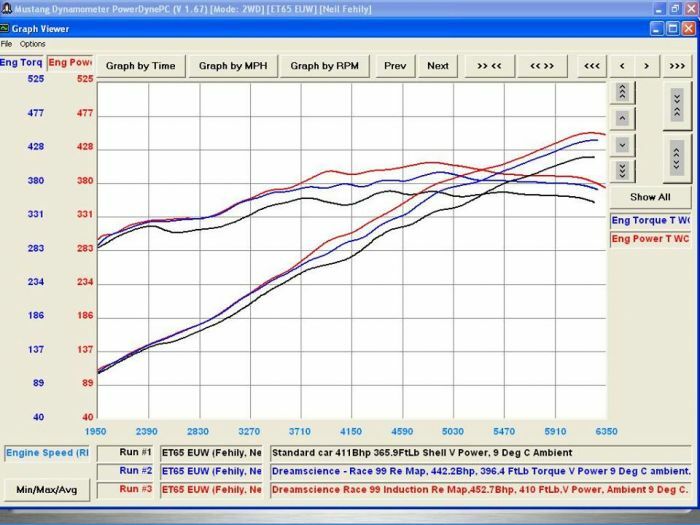 We proceeded to put the Stage 1 Tune file called RACE99, after a few hours we had the engine producing a mmuch more robust 442BHP and 396.4ftlb Then with the Additionn of the JLT intake system and the Stage 2 Remap called RACE99 Induction we saw a further gain and the engine produced an impressive 452BHP 410FTlb. “I had my brand new Ford Mustang 5.0 V8 mapped by dreamscience using the IMAP system. The vehicle only had 500 miles on the clock and I had been waiting for delivery for almost a year. The Dreamscience team fitted a JLT intake and had the performance map RACE99 Induction file loaded onto the car. Being a normally aspirated car I was not expecting a huge difference. Once finished I was amazed at the transformation it is smoother throughout the rev range, punches much harder on acceleration and even achieves more miles per gallon. From new the car always felt sluggish at pick up from low revs and seemed to run slighly lumpy. Now with the new Dreamscience map this has been completely transformed. Dreamscience are still developing more advanced map miles for the mustang so i cannot wait to experience what they come up with next. I would highly recommend the iMAP and JLT Air filter combination. They have managed to make a great car even more enjoyable. The team at Dreamscience are continously making improvements to thier Remaps and releasing updates. The updates are free and can accessed from the DS iMAP servers through the WIFI enabled function on the handset. Stage 3 and 4 tune files to be developed very soon.